Laura Gottschalk ’19 in D.C. I left W&L excited for two new experiences, having an internship and going abroad. A winter internship is a unique experience for a W&L student, as the school calendar does not have a long enough winter break to allow for a winter internship. I moved from Lexington to Arlington, VA –a fifteen-minute drive from downtown Washington D.C. I thought that I would miss my friends back in Lexington more than I do, but I am so glad I decided to have a winter internship and study abroad. My internship at EY has been a great learning experience. As part of the internship, we first had general training in EY’s home office in Mclean, VA to help us learn about the company. We then had two days of audit training where we learned about EY’s systems and how to audit certain accounts, such as cash and accounts payable. After training, I went out to my first client site. Interns get assigned to two clients and I was excited to get two very different ones. My first is in the aerospace and defense industry and my second is a subsidiary of a large communications company. Living in Arlington with another student from W&L and participating in the same program has been great, as we have been able to share our internship experience. I have enjoyed getting to explore downtown Arlington and going downtown most weekends. D.C. has so many things to offer: walking around the monuments, visiting all of the free museums, and great places to get food. I have enjoyed exploring the city and have also been able to visit my older sister who lives in D.C. She has been able to show me fun places to go and local restaurants. 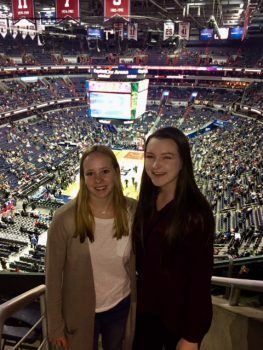 Laura Gottschalk ’19 at a Wizard’s game. My internship has also helped me see more of downtown D.C. because we have had several intern events. One of which was going to see a Wizards basketball game. I really enjoyed going to the game, since it is not something that I would have chosen to do myself. It has been great getting to know all of the other interns through the events scheduled by EY and also when we have gone out to restaurants as a group. I have enjoyed learning about other colleges’ accounting programs and the variety of different experiences each intern has had. While working for my first client, I enjoyed getting to know two of the other interns. It was nice having someone else to talk to, get advice from, and being able to ask questions. One of my responsibilities as an intern was ordering and picking up dinner every day for the team. Us interns always teamed up on dinner orders, making it a bit easier. Some of the other things I was tasked with included formatting excel spreadsheets, preparing work papers and organizing documents. I have learned a lot more than I ever thought I would with the internship so far. Working during the busy season has allowed me to receive tasks that I never would have received as a summer intern. There are also several W&L alumni that I have gotten to work with. A great thing about auditing is that they teach you everything you need to know and do not expect you to come in with a lot of prior knowledge. My biggest piece of advice for anyone interested in doing this program is to stay positive throughout the busy season internship because the teams get stressed out with upcoming deadlines. My team commented that it was great to have an intern there that had a positive attitude while they were stressed out. My second client is a technology company in the communications industry. It has been very different than the first client, as the entire work environment is much more casual. There are a lot of open meeting rooms, kitchen spaces, and casual seating areas. My second client also has a policy of having free lunch for all their employees, which has been a great perk and helped me save some money. The team is in busy season, but they seem less stressed, as they do not have a stringent deadline like my first client did. As an intern, I do not work more than 40 hours a week, so I have not had to work very long. My first team worked up-to 55-hour weeks. I have enjoyed getting to see to vastly different clients that have contrasting work environments. So far, my experience living in Arlington has been great, and I am very excited to leave for Sydney, Australia in less than three weeks. I have always wanted to study abroad and get to live in another country for a few months. It has been fun planning trips and things to do while I am in Sydney and I can’t wait to leave for Australia!